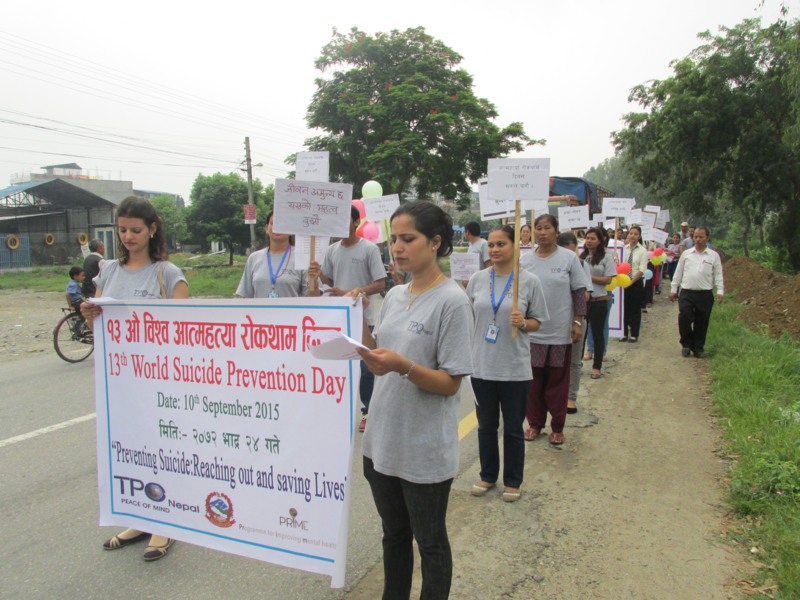 On 10 September, globally observed as World Suicide Prevention Day, the PRIME Nepal team set out on a rally in Chitwan. The team marched in support of this year’s theme: “Preventing Suicide: Reaching Out and Saving Lives.” The PRIME Nepal team had taken the lead in organizing the event in collaboration with the District Public Health Office (DPHO) and a few other nursing and medical colleges. This event was an opportunity for the PRIME team to educate the public on suicide and mental illhealth. Anti-suicide slogans were displayed on placards, and leaflets and briochures detailing mental health problems and available services were distributed. A psychiatric nurse of Chitwan Medical College and the PRIME district coordinator concluded the rally with a brief talk about World Suicide Prevention Day. Local media representatives attended the event in droves and 14 local media houses, including 5 print media, 3 radio stations and 6 television channels, covered the rally.